Irrigation is vital for crop production in many cane farming districts. Best practice irrigation management aims to supply sufficient water for crop growth while minimising the amount of excess water that is lost as either run-off or deep drainage. Irrigation water can be a conduit for the movement of pesticides, nutrients and sediments off farm. A well designed and managed system that minimises deep drainage and run-off, while capturing and reusing unavoidable run-off, will substantially reduce potential losses. The Queensland Government’s election commitments to reduce nitrogen run-off in key catchments such as the Wet Tropics and the Burdekin pose a significant challenge to farmers. However, many farmers have taken on the challenge as they find new and innovative ways to deal with the incredible variation in water supply and delivery along the length of the Queensland coast. CANEGROWERS CEO Dan Galligan said proactive partnerships such as the Reef Alliance were helping to achieve real outcomes on the ground and assisting growers to implement often expensive changes to farming practices faster than they otherwise would have been able. Soil probes and weather stations are helping grower Gary Raiteri to irrigate his Proserpine crop only when it’s needed for maximum growth. Gary has now modified his irrigation machinery, practices and technology used on the farm resulting in less water and electricity costs, reduced run off and increased productivity. An ultrasonic water flow meter used in the Isis district is helping to take some of the guess work out of one of the trickier elements of irrigation management. Accurate flow rate data is helping farmers to streamline their systems and become more efficient in the ways they use water and electricity. 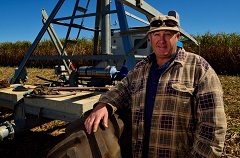 Bevan Manderson is using the extra data as well as a new overhead centre pivot system to effectively and efficiently irrigate his steeply contoured cane farm in the Redhill Farms district near Gin Gin. Achieved with part funding from the Reef Programme, Bevan has been able to reduce his water use and electricity costs, with virtually no run-off on his farm. Watch more. 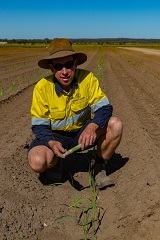 Home Hill cane farmer Aaron Linton has used Reef Programme funding to trial a new drip irrigation system against traditional furrow irrigation. Aaron says using the sub-surface drip tape has several benefits including being able to better target water and fertiliser application with the fully automated system. Watch more. Water is a balancing act for Bloomsbury grower Layton Mitchell in the Mackay District. On one hand he’s building drainage lines to take spring water away from his crop and on the other he’s diligently monitoring his cane’s growth to make sure it has the right amount of irrigation at key points in its growth phase. Layton’s efforts include underground drainage, above ground water storage, soil testing to increase irrigation outputs and fertiliser being applied with a stool splitter, all while dealing with the natural complications of intense weather patterns including cyclones and drought. Read more. Imagine being able to remotely sense the water needs of your crop, be able to strategically manage your water use efficiency, and adapt on-farm practices based on precision agriculture, sensors and connected technology. CANEGROWERS Environment and Sustainability Manager Matt Kealley says precision agriculture and remote sensing technology offers many options for growers wanting to better understand their farm’s irrigation and drainage needs. Smartcane BMP can deliver a number of benefits for farmers. Read more. MSF Sugar’s Tableland farms are happy to share the results and benefits of switching to a sub-surface drip irrigation system. MSF’s Irrigation Supervisor Aaron Moore said on-farm water efficiency was critical in an area that had traditionally been grown using overhead or flood irrigation methods and was facing water supply shortages. The company recently harvested the first blocks where plant cane and ratoon cane had been grown under sub-surface drip irrigation, and the results have been promising. “We are growing bigger cane for the total volume of water applied. Fertigation is a big asset in drip irrigation. Drip irrigation enables nutrients, fertiliser and chemicals to be injected directly into the root zone of the crop at any time during the year,” Mr Moore said. Read more. numerous benefits to the district. In the Maryborough district, MSF Sugar is investing $15 million to improve water use efficiency and boost productivity on its farms with the rollout of 40 centre pivot irrigators. CANEGROWERS director Allen Birt, who leases his farm from MSF Sugar, says the change to a low-pressure overhead system is expected to save him time and money, increase his yield and benefit the environment. By making more efficient use of water, using less energy and reducing farm run-off, Allen is confident that MSF Sugar’s investment in centre pivot technology will help deliver sustainability in the Maryborough district. Watch more. If yield is the measure of a good cane grower, then the Bundaberg/Isis region’s Greensill Farming Group must be up there with the best. In an area that typically averages 80-90 tonnes of cane per hectare, Greensill Farming is cutting almost double that figure, achieving up to 150 tonnes. While the Greensill family do things differently to many of their neighbours, the biggest difference is not size, crop choice or even tonnage – it’s the farm’s irrigation system. Greensill farms operates a high efficiency furrow irrigation system, something quite uncommon in the Isis district, focused on reticulation, reduction of chemical and nutrient run-off and overall water efficiency. Read more. Isis district farmer Graham Zunker and son Greig are reconfiguring their farm to suit a new low pressure lateral overhead irrigation system, in one of the final stages of a five-year all-of-farm project to reduce energy consumption and increase crop irrigation efficiencies. On a windy day it is easy to see why the Zunker’s made the switch from water winch irrigation to a low-pressure overhead system - the winch’s struggle with spray drift meaning uneven watering of the crop, and the greater potential for nutrient run-off and reduced productivity. The capacity of the lateral system to get around the farm faster, and water more gently and evenly is helping maintain readily available moisture in the soil, reducing crop stress and boosting tonnage. Watch more.